Q. 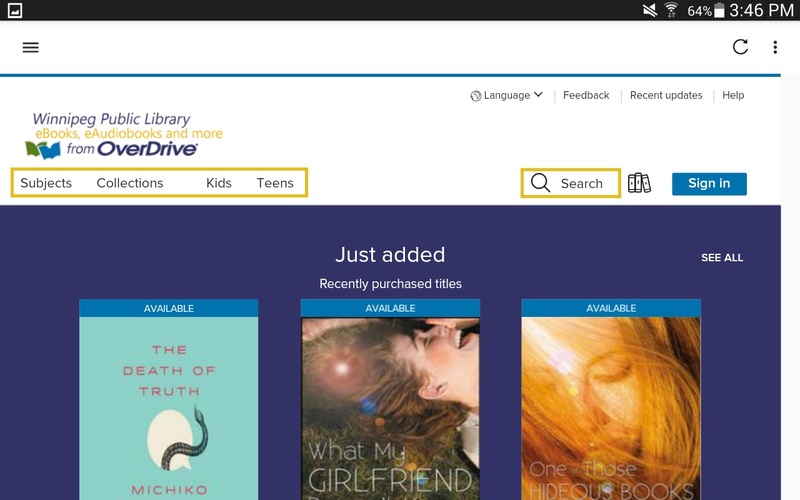 How do I set up the OverDrive app on my Android device? 1. Install the Overdrive App from the Google Play Store. Search "Overdrive" on the Play Store and tap Install. Once on your device, select the icon to open the app. 2. 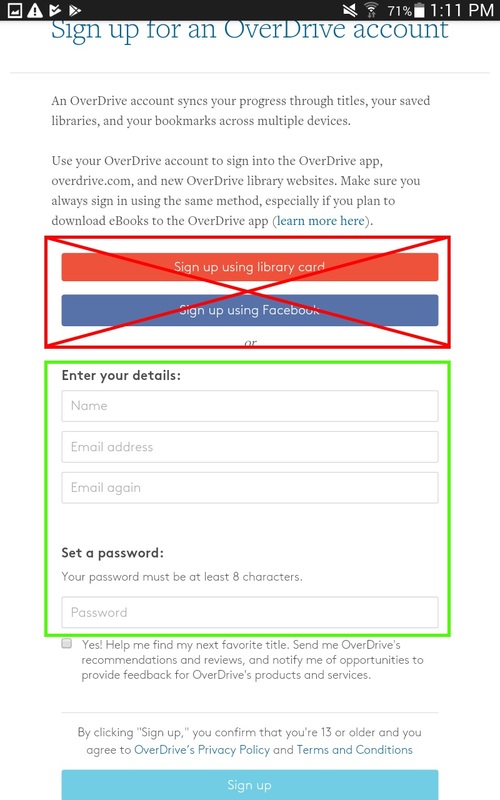 At the OverDrive welcome screen, you will need to either sign up or sign in to an OverDrive Account. NOTE: An OverDrive Account is not the same thing as your OverDrive Library login (barcode and PIN). It is a separate account made with an email address and password and used only to identify your device as an authorized device and sync your reading progress across devices. 3. If you have used Overdrive before, tap "Have an account? Sign in" and log in with your email and password. 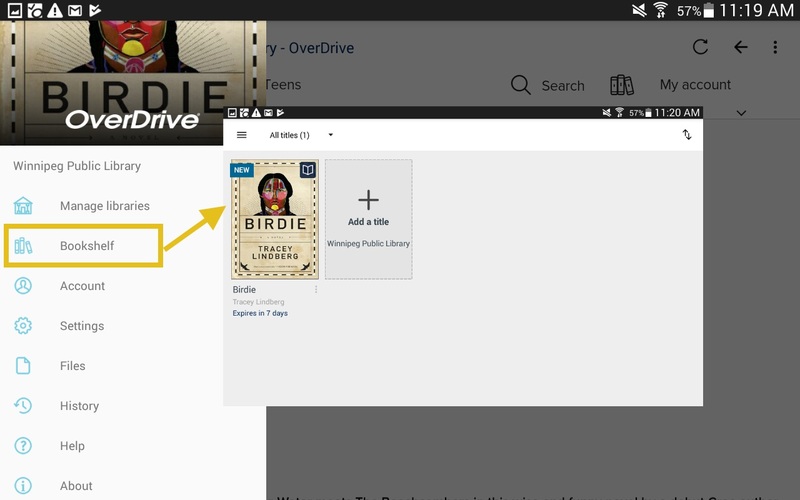 If you have not used OverDrive before, tap Sign Up to create a new account. Enter your name, email and create a password in the empty form boxes. Do not use "Sign up using library card" or "Sign up using Facebook". 4. 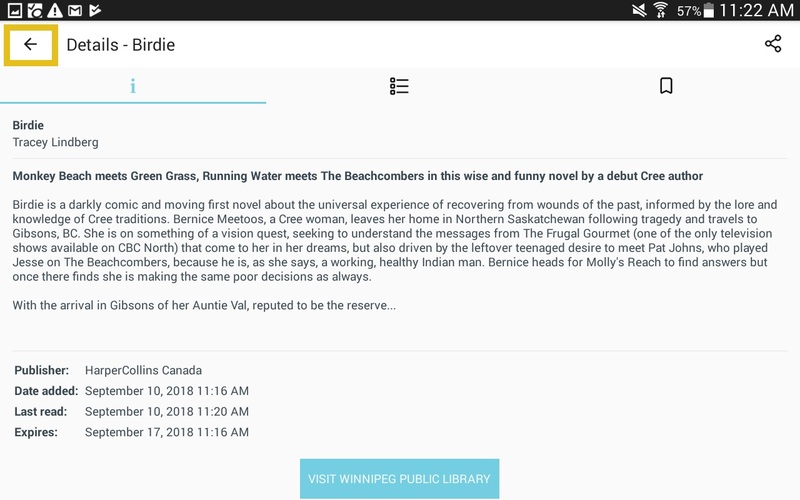 To borrow books you need to connect your app to the Winnipeg Public Library Overdrive collection. Tap on the "Add a title" box to open the search menu. 5. 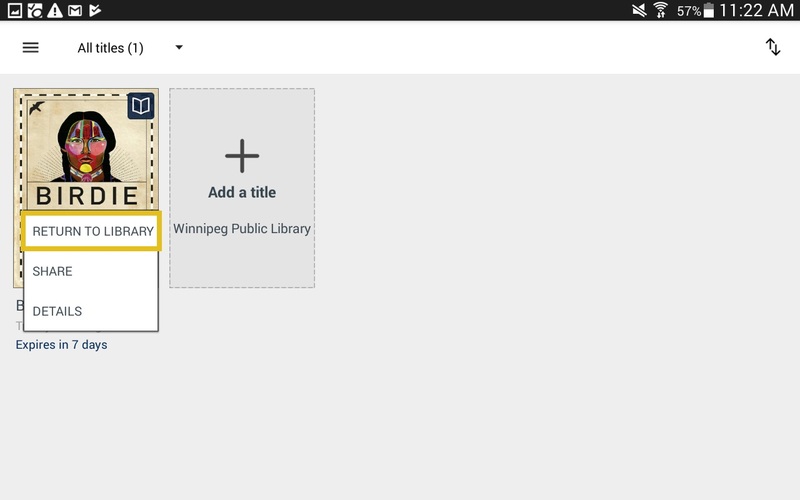 Search for Winnipeg Public Library and then tap on the Search box. Searching just "Winnipeg" will bring up a very long list of entries to scroll through. 6. 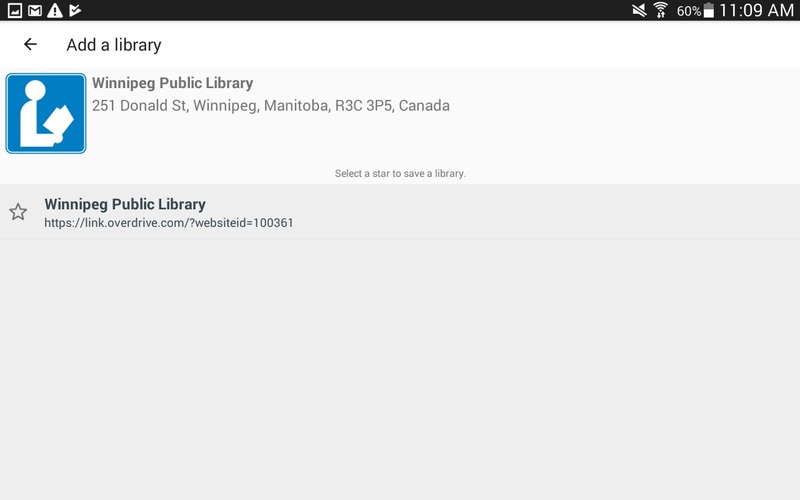 Tap on the entry for Winnipeg Public Library and then tap on the star to save it as your library. 7. 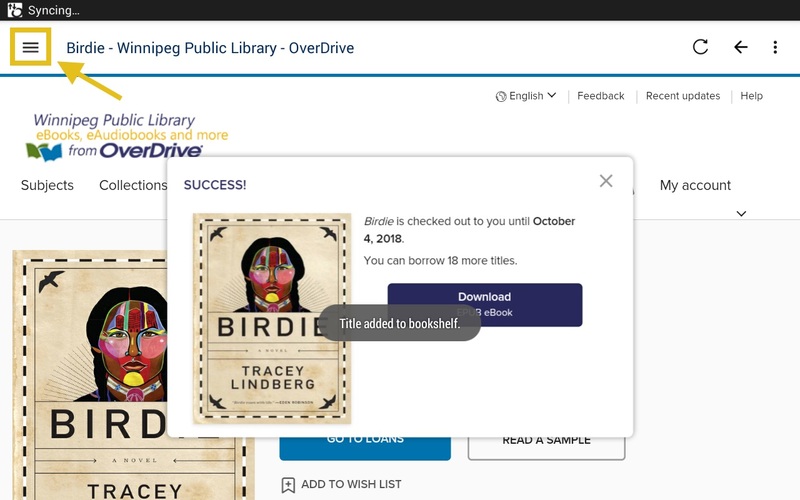 After you add Winnipeg Public Library you will automatically be taken to the Overdrive website. 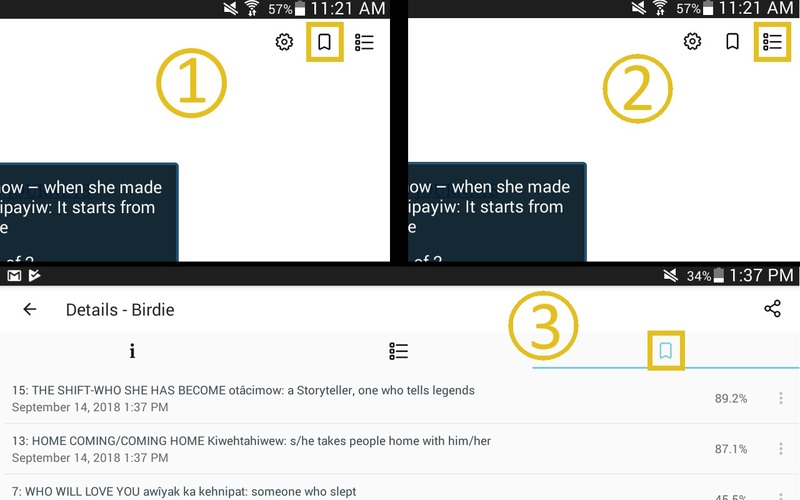 To get back to the Overdrive app at any time, tap on the three-line menu icon in the top-left corner. 8. 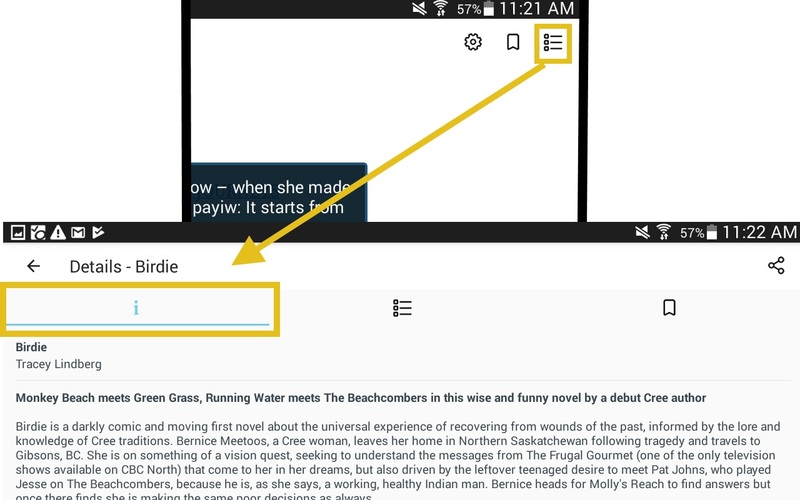 Search for books by tapping "Search" and search box will appear. You can also browse by subjects, collections, as well as items specific for kids or teens. 9. When you find a book you want to borrow, check it out by tapping the “Borrow” button. If you have not signed in yet, you will be asked to sign in at this point. 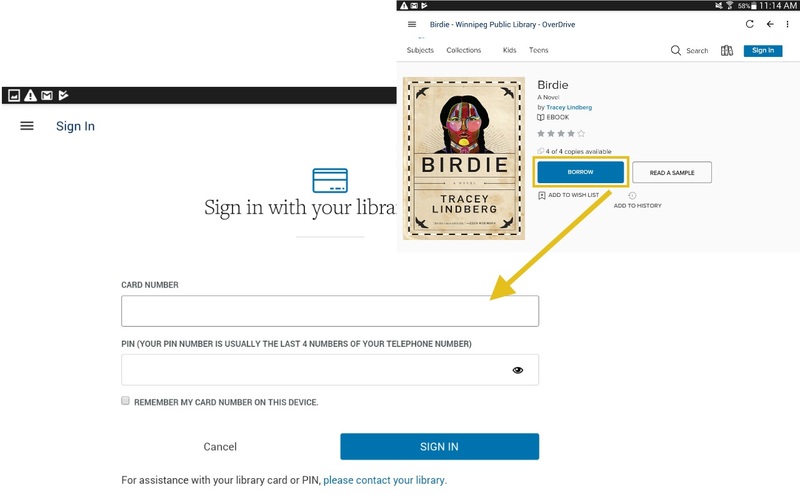 Enter your library card (no spaces) and PIN (usually the last four digits of your phone number). 10. After you sign in, the you will be asked to confirm how long you want to borrow the eBook. 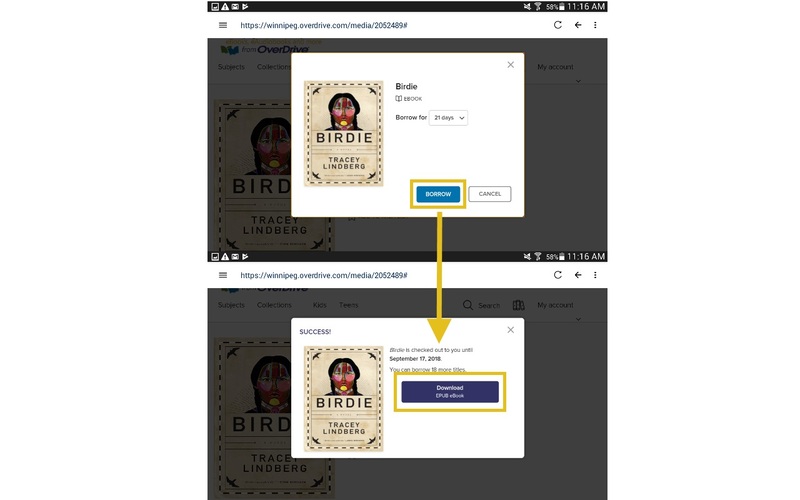 Tap "Borrow" again, and then tap "Download" to add the book to the app. It will download the book to your app for reading offline. 11. 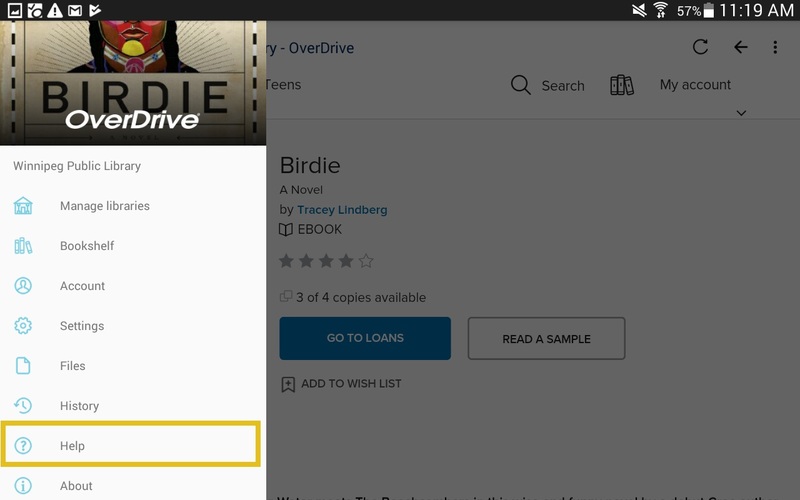 A message will pop-up letting you know that the book has been added to your Overdrive app bookshelf. 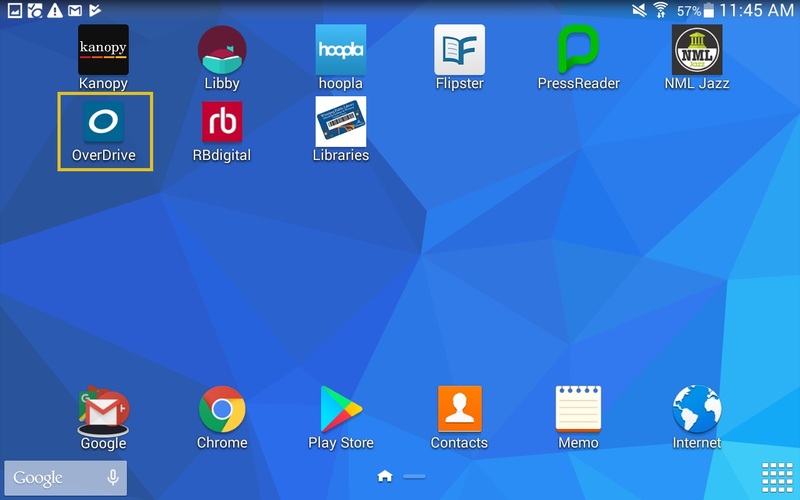 To get to your app’s bookshelf, tap on the three-line menu icon. This will take you to your Overdrive app menu. 12. To see all of the books that you’ve borrowed and added to the app, tap on Bookshelf. Tap on the book cover to open the book. 13. 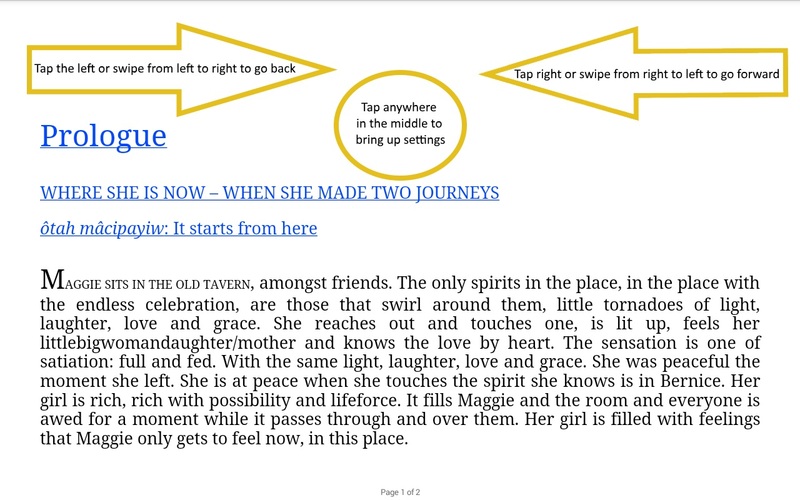 To navigate the book, tap on the right side of the page to advance to the next page. Tap on the left side to go back by one. You can also swipe from right to left or left to right to advance or go back. 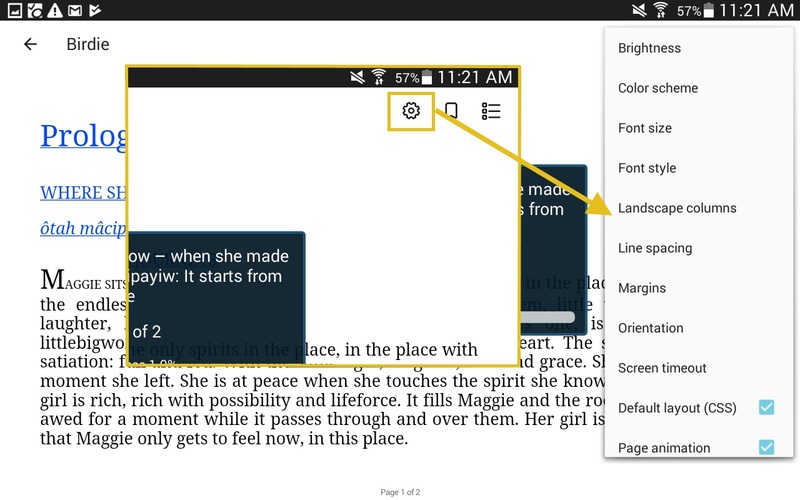 Tap anywhere in the middle of the screen to bring up a menu of options to change your reading settings. 14. Once you tap in the middle of the page, the settings show up on the top right corner. Here you can change how the book looks while reading it. Tap on the gear icon to see the setting options and make changes. 15. To bookmark part of your book so that you can return to it later, tap the middle of the screen and then tap on the bookmark icon (1). 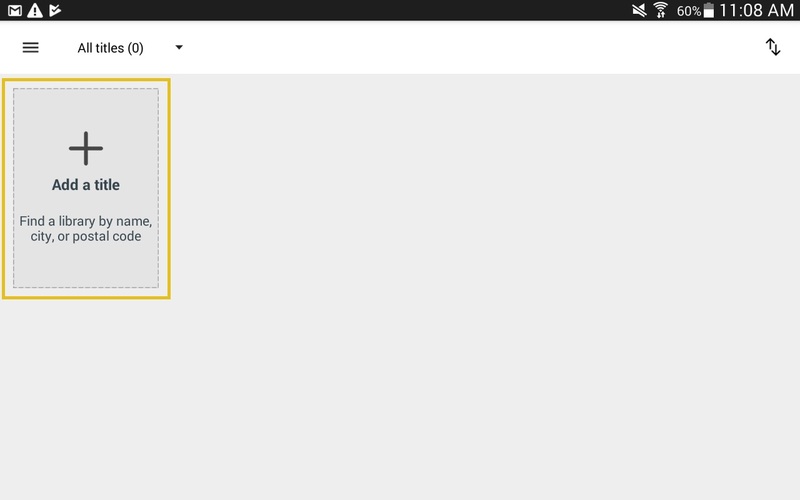 To see your list of bookmarks, tap on the Table of Contents icon (2) and then tap on the Bookmark icon there (3). 16. To access the Table of Contents for your book, tap on the middle of the screen and then tap on the Table of Contents icon. If you tap on any of the chapters listed you’ll be taken to that part of the book. 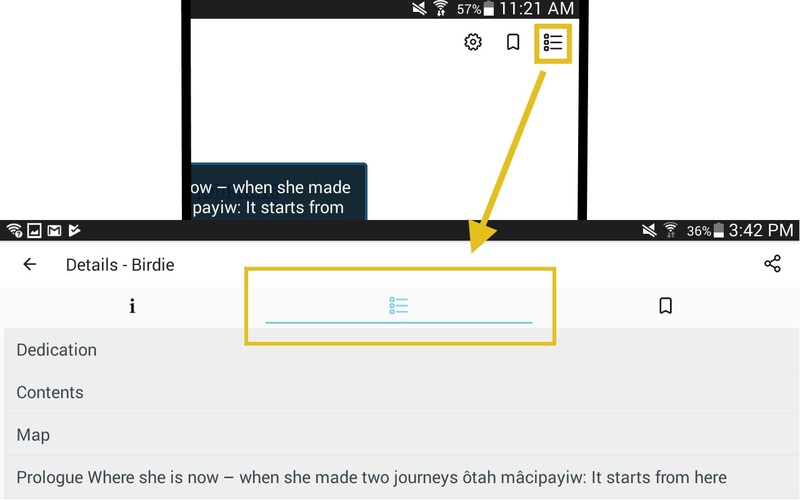 You can also access the book's general description by tapping on the "i" symbol. 17. To return to the book, tap on the back arrow. 18. To return a book before it is due (e.g. if you’ve finished it or are at your borrowing limit and need space to borrow another), return to the Bookshelf, and then press and hold on the cover of the book. 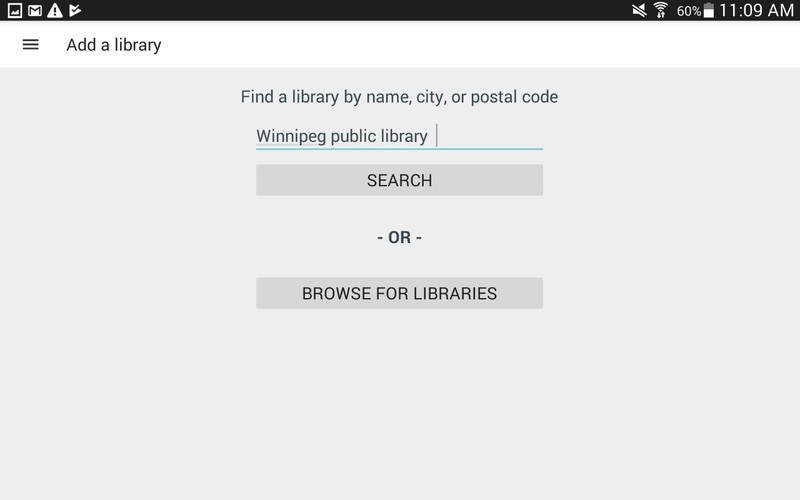 A menu will appear and then tap on Return to Library. 19. For additional help resources, tap on the Help section in the App Menu. If you have any additional questions about this process, please Ask Us!